IRL Resources provides an easy and accessible way to introduce the latest Christian music into your household all year long with devotional curriculum that helps you inspire and grow your family. A 1-Page PDF Leader's Guide that provides an outline of the study. Links for streaming the song on YouTube and Spotify. 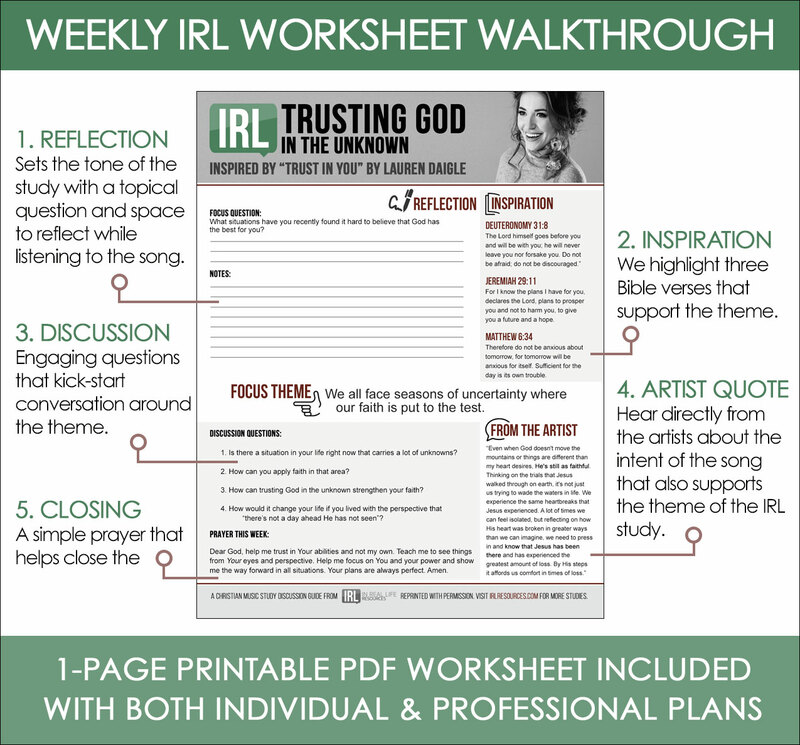 A one-page worksheet that includes a focus question, Bible verses, discussion questions, a quote from the artist and a closing prayer. IRL Resources is working with the top Christian labels and artists ensuring you'll get quality artists and songs you know and love each and every week like Newsboys, Lauren Daigle, Hawk Nelson, MercyMe, Jordan Feliz, Lincoln Brewster, Jaci Velasquez and more!. Whether you are a parent looking to engage your children, a homeschool teacher exploring different opportunities for Biblical study or an individual wanting to spend time with God, IRL Resources is an affordable option to not only listen to great Christian music, but to study the biblical themes these songs express. Each week, for 52 weeks, you'll get the following resources that you can use for engaging in real conversation. 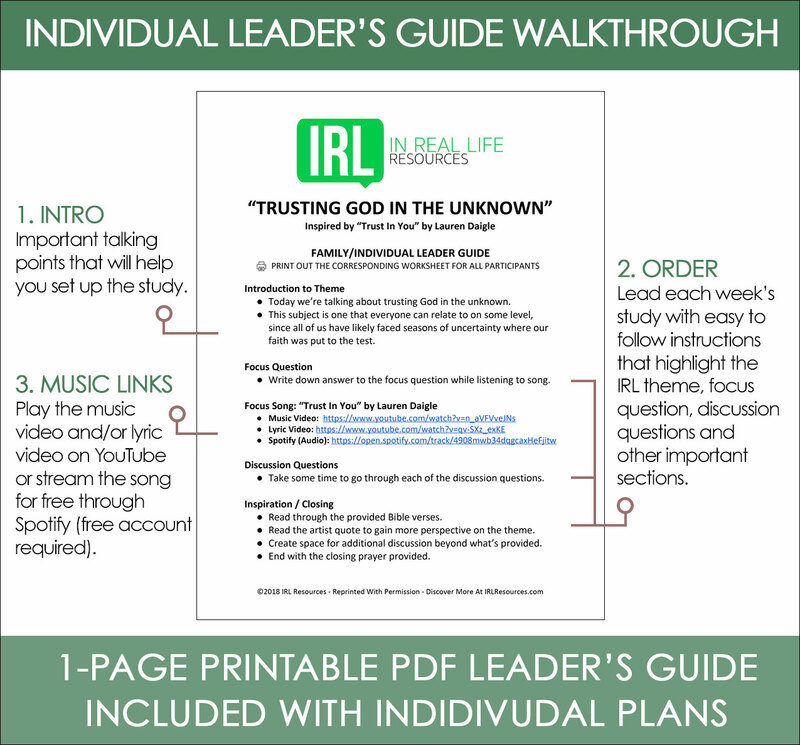 Each week, you'll receive a Leader's Guide that will help you walk through the related study step by step. You'll get talking points, the overall order and links to stream the song on YouTube and/or Spotify. Each week's worksheet is designed around conversation. From places to take notes, to thought-provoking questions, bible verses, focus themes and quotes from the artist, everything is designed to spark engagement with the theme. 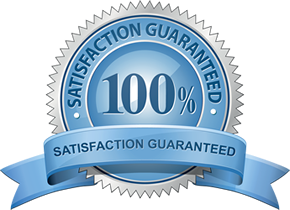 We are so confident you will love your IRL Resources subscription, we offer a 30-day money-back guarantee. No questions asked! If for any reason you are not happy with your subscription, email us at sales@irlresources.com and we will take care of you! "My children are 11 and 9 and we have had a blast going through the IRL studies. They make it incredibly each to open up conversation with my kids in new ways and because they love music, I have their attention from the beginning. Thank you for this amazing resource for my family"! I am a small town youth pastor and these studies are extremely accurate, fun, and educational! The lyrics of these songs are so deep and valuable and so much will be gained throughout the youth of this nation by IRL’s song study. This will undoubtedly change this nation for the better!" "Incorporating music into a Bible study is a great idea and I think it is less intimidating to people, inviting them to share more freely." "I love the idea of bringing music into a bible study. As a person who loves music, this is a really neat way of thinking outside of the box!"